Visible on the computer screen at her desk, Catherine Flores, PhD, keeps a quote that says “Make it happen, make it matter.” Whether it is making every second count in the lab or during her morning fitness routine, Dr. Flores gives everything she can in all that she does. She began her involvement in research at the age of eighteen and found herself drawn toward translational cancer research because of its direct impact on patients. “I know whatever I develop will go to the clinic and help people, and that means so much to me,” she says. Dr. Flores believes that cancer research centers on working toward a cure and finding new, novel treatments in the meantime. She says each research project builds upon the other, so while a new treatment is being developed, another treatment is being finalized. “The timeline to get our treatments to the patients is much shorter than it is with other therapies,” says Dr. Flores. Her team is tenacious and persistent. They are developing new therapies that are improving and changing the lives of patients. Dr. Flores is currently working on developing an immunotherapy treatment for pediatric patients with treatment-resistant brain cancers. Dr. Flores is motivated by her patients every day. “It’s very humbling to meet the patients, and I always thank them for giving us a chance to have an impact on their life,” she says. Recently, she helped a young patient fulfill his wish of becoming a scientist. She scheduled time for him to spend in the laboratory with her and her team, and together, they conducted some fun experiments. Dr. Flores says meeting the patients, especially the long-term survivors, is the most rewarding part of her job. Dr. Flores has developed a pre-clinical platform that utilizes tumor-specific autologous immune cells to efficiently target intracranial tumors. Her research interests are primarily in determining biological interactions between various cellular compartments involved in adoptive immunotherapy. Her studies also focus on leveraging systemic toxicity of frequently practiced clinical treatments in order to further enhance anti-tumor efficacy of immunotherapy. 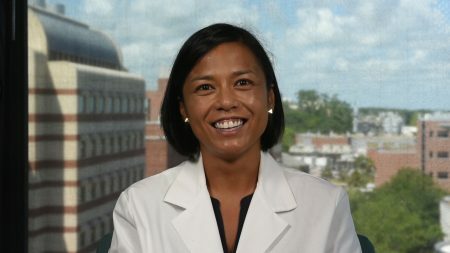 When deciding to move to Gainesville from San Francisco, Dr. Flores didn’t hesitate to continue her work with Duane Mitchell, MD, PhD, director of the Brain Tumor Immunotherapy Program at UF Health. She and her husband enjoy going to the beach, spending time at the springs and eating at the local restaurant, Public and General. If you happen to look inside Dr. Flores’ desk drawer, you will find streamers and balloons for birthday celebrations. She is known for her festive spirit at work. If she could create her own film biography, it would be called “Curing Cancer in Style”, and Dr. Flores says Mindy Kaling would be the perfect actress to play her part. Taking this to heart, Dr. Flores has dedicated her life to saving lives and finding a cure for brain cancer.